On our own paths we parallel each other. We move ahead, fall behind, and we go our own way. Life is not a state, it is a process. 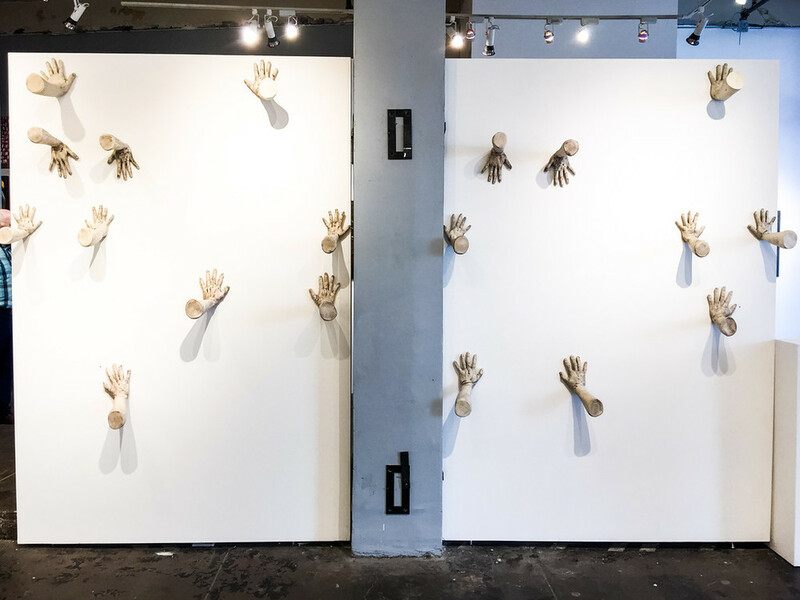 This exhibit is the story of a cartwheel competition told by 80 ceramic hands pushing off the gallery walls. It is a rhythmic story of community. It is a story of you and me and the human condition and in this manifestation, it is a testament of my own process and progress. The cracks, flaws and damage that we wear are far more compelling to me than any form of perfection. Frown lines, pores, and scars are the markings of life and history, the truths of nature, time and experience. Correspondingly, the competition begins with the first hands that were casted and progresses around the room to the last, each hand holding time and memory. Through the phases of my experimentation, neglect and break throughs, the timeline of Momentum unfolds and then cycles. The personal intertwined into each hand with varied life beats ~ focus, distraction, despair, fruition... Moments of being pulled away to care for my 4 year old, or myself. Instants of uneasy compromise and moments of affinity with the process, these beats are all here. This is a story of the velocity of energy, the kicks of play and the freedom of happiness. Show runs until August 27th.